Last week we had a fantastic holiday in Doolin, Co. Clare. 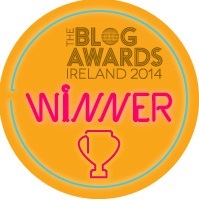 We booked a holiday home through the Supervalu Getaway Breaks, just as we did last year when we went to Youghal. This year the holiday home that we chose was in the Tir Gan Ean holiday village, which is just behind the Tir Gan Ean hotel. The holiday homes are quiet, and there seemed to be two types – dormer bungalows, and two storey houses. We got a three bedroom dormer bungalow. As you can see from the photos of the bedrooms, all of the rooms were large – there were two double rooms, and a twin room. 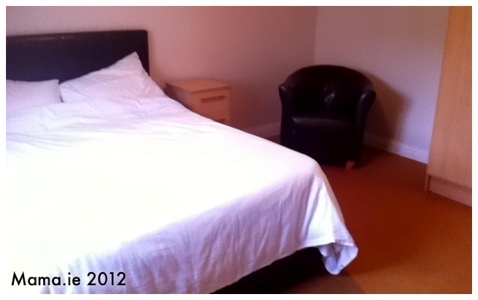 One of the double rooms was downstairs, with the other two bedrooms upstairs. 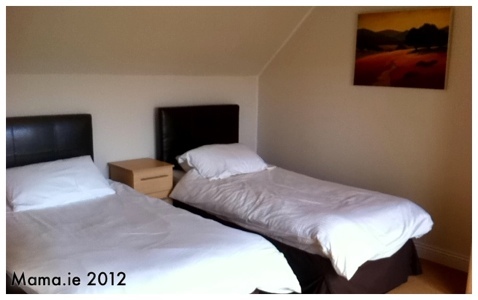 I was actually surprised by just how spacious the bedrooms were. Especially the upstairs bedrooms, with the lovely bright dormer windows. We ended up taking one of the single bed mattresses and putting it on the floor of our room for Little Man. He absolutely loved it. And it was great for us – we didn’t have to worry about him rolling out of bed (though he did roll from the mattress to the floor once during the week – it just wasn’t far enough to wake him! ), and he thought it was a real treat to be able to see Mammy and Daddy when he woke up in the morning. 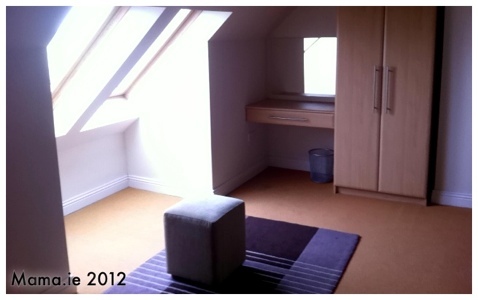 See how spacious the rooms were! As well as a bedroom and bathroom downstairs, there was a large kitchen-dining room-sitting room in one. 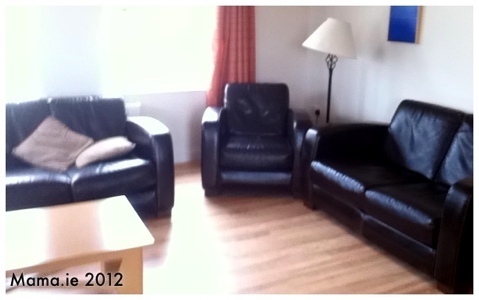 The furniture was fine – comfortable, and plenty of seats. 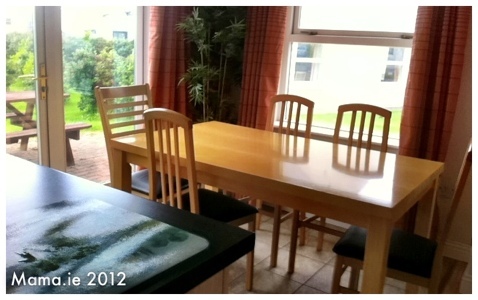 We particularly liked the dining area – it was bright and cheery, even on the inevitable rainy day during the week. And one day, it was actually nice enough for us to open the patio doors and eat at the table provided outside. The kitchen was well provisioned – all the usual things you’d expect – pots, pans, dishes, cutlery. We did discover that there was no bottle opener, so we had to wait until we got home to open that particular bottle of wine! But everything else we needed was in place. Location-wise, these holiday homes were great. It was a two minute walk to the nearest shop, and both Tir Gan Ean hotel and Hotel Doolin are close enough to be visible from the house. If you’re planning to stay here, you definitely need a car to get around – but I think that’s true for most places in Clare. With the car, we were an easy fifteen minutes from Lisdoonvarna, and twenty minutes from Lahinch and Ennistymon. There were two negatives about our stay that I have to mention. The first occurred within a few minutes of our arrival. We had driven from Dublin, leaving at 11am, and driving in awful weather for hours and hours. Of course there were potty breaks and lunch breaks on the way down, so it was almost 4pm when we finally got to Doolin. I was exhausted and didn’t want to see the car again for days! As we were checking in, the woman taking our details mentioned “All I need now is the €150 cash deposit.” I knew nothing about a cash deposit. I knew there would likely be a deposit – but when we’ve stayed in holiday homes previously, a credit card number has been sufficient for the deposit. Not in this case. We searched our wallets and came up with €115, but when I asked if that was okay, I was told that it wasn’t. So of course my next question was where would I find an ATM. Guess what? No ATM in Doolin. I had to get back in the car and drive to Ennistymon to get the money for the deposit. Granted it is not a long drive – but I had already spent half the day in the car, and another 40 minutes driving to an ATM was not exactly something I was keen to do! But I did it, and everything was smooth sailing after that. Our second negative was in relation to general maintenance of the holiday home. The main pieces of furniture were fine. And the beds were clean and extremely comfortable. 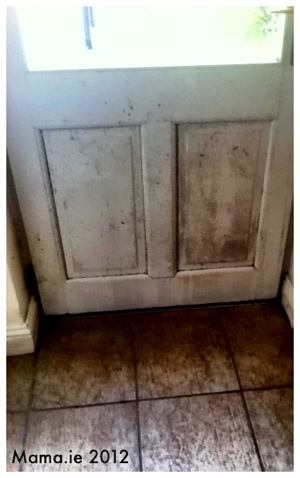 But other details, like the mildew on the back door and the stains on the carpets could and should be addressed. Shame about the back door! I did not receive any compensation for completing this review, and all opinions are honest and my own!